Rod Moss is a Ferntree Gully boy, a whitefella who found himself in Alice Springs thirty years ago and who stayed there. In all the moral disorientation of the Centre, in its beauty, its grandeur, its squalor and its mystery; in the perplex of making and losing marriages, of fathering, of teaching, of reading deeply, of engagement with the dark cinema of darkest Europe, Rod Moss found friends in a clan of blackfellas living in Whitegate, one of the town camps. Moss differed from most of us whitefellas who come to the Centre. He stayed. He painted (in a distinctive genre of his own creating) the lives of his friends. And through all the years of his staying and his painting and his friendships, Moss kept a journal. That journal gave birth to his first book, “The Hard Light of Day”. The book won the Prime Minister’s Prize for non-fiction. More significantly, the book won the praise of Ray Gaita, who described it as one of the best books he had ever read. 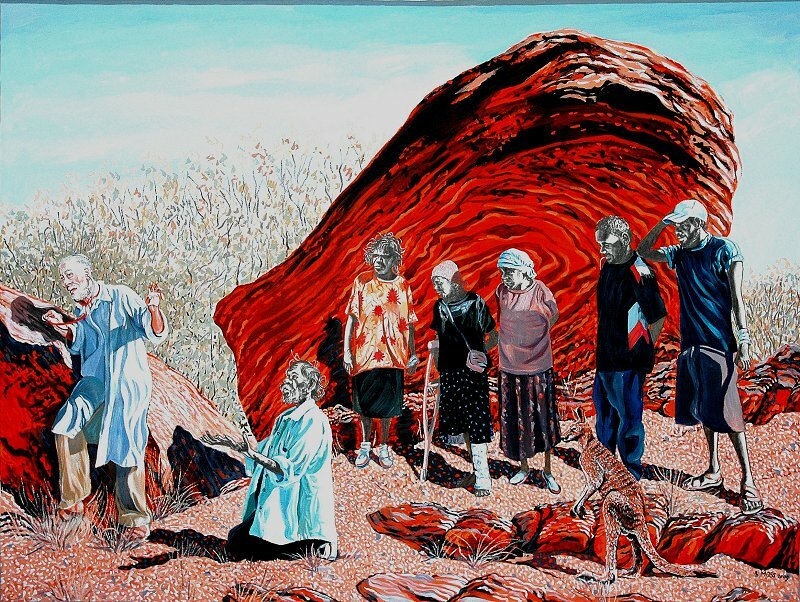 When I say Moss found himself in Alice Springs, I mean he found himself in ways most of us non-indigenous people never do: he found who he was, what he was doing here; he came to be in country. When I say Moss found friends I also mean he lost them. Those losses are recorded, drop by drop, blow following blow in Moss’ first book, and in the second, soberly titled, “One Thousand Cuts”. I believe that in its swelling lament and its growing clarity, “One Thousand Cuts” surpasses even “The Hard Light of Day”. In a remarkable sequence of events “One Thousand Cuts” will be launched at Readings in Carlton on Wednesday 9 October at 6.30pm. And a retrospective exhibition of Moss paintings will be opened at Anna Pappas Gallery two days later. If Moss’ paintings are luminous, his writing a prolonged jazz riff, the photographs are something else. I invite readers of this blog to attend one or both of these events. I will be glad to see you.